The Highland Lakes region of Central Texas Hill Country offers many fun activities, places to visit and things to do, including - renting a boat or jet-ski on Lake LBJ, taking a wine tour, 18 holes of golf, horseback riding, ATV trails, visiting a state park, spelunking at Longhorn Caverns or jumping off a rock bluff at the Devils Waterhole. 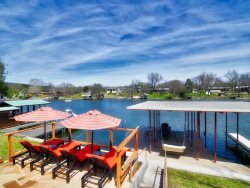 All of Front Desk Vacation Rentals lake homes are located within a 30 minute radius of each other, settled on prime Lake LBJ waterfront. Although Lake LBJ is usually the main attraction for our lake home vacation guests, we also recommend taking advantage of the breathtaking scenic and natural features the area offers. Some examples, all close by, are caverns, granite rock outcroppings, canyons, swimming holes and wildlife. Activities include wildflower/fishing/river tours, hikes/trails, seasonal and ongoing events, wine tours/tastings, state and city park activities, shopping, and much more! Listed below are but a few Day Trips we recommend, selected due to their close proximity to Lake LBJ, and popularity. All are only 30 to 45 minutes, or less, from each Front Desk lake home rental. Through shady forests and across rocky hills and sparkling blue waters, this top state park features a long list of activities. You can camp, backpack, hike, geocache, swim, kayak, canoe, and observe nature. The park features 9 miles of hiking trails and you can hike a small canyon or swim at Devil's Waterhole. You can also explore waterfalls upstream when Valley Spring Creek is running. This park is named for the Longhorn Cavern, a limestone cave that was once an underground river. Before it became a tourist attraction, it was used over the years by Indians, Confederate soldiers, outlaws and also a speakeasy during the Prohibition period. Longhorn Caverns is located off of Park Road 4, between Burnet and Kingsland. Another perk is, it's only a few miles from Inks Lake State Park (also off of Park Road 4). Further down Park Road 4, towards Highway 29, you can drive to other nearby attractions such as Canyon of the Eagles and the Vanishing River Cruise. An ecological cruise that provide spectacular views of Lake Buchanan, the Colorado river, native Texas wildlife, waterfalls, bird watching and wintering bald eagles. For contact and website information, further information about the above activities, other area attractions, shopping and dining, please look to our detailed list below. Or, feel free to call Front Desk at 830-693-8564 or 830-385-6659. We would be happy to help! Marble Falls Barber Shops and Hair Salons located near Lake LBJ. We recommend Brothers Barber and Beard and TWIST Hair Studio & Boutique. Wakeboard Boats, Ski Boats, Pontoon, See-Doo, Jet-Ski and personal watercraft rentals in The Highland Lakes - Lake LBJ, Inks Lake, Lake Marble Falls and Lake Buchanan. Kayak rental on The Highland Lakes - Lake Buchanan, Inks Lake, Lake LBJ and Lake Marble Falls. Take a stress free Lake LBJ boat tour and take in the scenic wildlife, beautiful scenery, as you enjoy a glass of wine from Perrisos Vineyard and Winery. Scenic boat tours are also available on Lake Buchanan by Vanishing Texas River Cruises. Treat yourself to a massage in the comfort of your Lake LBJ Vacation Rental or at the Depot, service provided by Kingsland Massage Depot. Local dining and restaurants in the Highland Lakes / Lake LBJ, Texas Hill Country and Marble Falls, TX. Some great choices are Blue Bonnet Cafe, Wingman BBQ, Bella Serra, Docs Fish Camp, and River City Grill to name a few. Grocery, clothing and jewelery stores in The Highland Lakes, Kingsland, Burnet, Marble Falls and Lake LBJ. The Highland Lakes, Lake LBJ, Marble Falls, Horseshoe Bay and Kingsland, TX areas offer many exciting and fun things to do like Cypress Canopy Tours, Hidden Falls ATV Park, Marble Falls Skate Park or Wakeboarding on Lake LBJ, Inks Lake, Lake Buchanan or Lake Marble Falls. This part of Central Texas Hill Country offers some of the best golf courses in Texas, like The Legends, Delaware Springs or Lighthouse Country Club, formerly Packsaddle Golf Course. Horseshoe Bay also offers Slick Rock, Ram Rock and Apple Rock golf courses. Wineries and accommodations located in Texas Hill Country, Marble Falls, Horseshoe Bay, Lake Travis, Austin, TX, The Highland Lakes - Lake LBJ, Lake Buchanan, Inks Lake and Lake Marble Falls.